Laminate flooring installation in Durban and Cape Town is a fairly large industry with many contractors and many suppliers. Installation prices are normally within a tight band with most installers charging more or less the same amount to install. Materials however can range greatly with some very affordable laminate floor boards and some more expensive ones. Quality varies too and one should always purchase them from a reputable supplier so that in the event of defects they can be swapped out or a refund obtained. It is not uncommon for a client to select and purchase their own materials and to then appoint an installer to install them. However, as is the case with most contracting jobs, the client should be careful to purchase the right amount of materials so as not to waste materials and also not to slow the contractor down. There is nothing more frustrating for a contractor to arrive at the job to find that he can’t do it because a crucial part of the material is missing. It slows him down and takes extra days to complete. A contractor makes his money by doing the job quickly and correctly the first time. If he is waiting for materials he loses days and if he rushes his job and takes short cuts he ends up coming back to fix problems which also results in lost days. is first laid on the floor to provide a cushion between the boards and concrete. One of the most important aspects of installing laminate flooring is to make sure your floor is clean and flat. If the floor is too far out of being flat it will result in boards lifting. Having said that, there is some tolerance because the boards are not as rigid and unforgiving as solid wood. So run a straight edge over it and make sure it is relatively flat. If it is not and it is very badly out of flat, consider screeding it to get rid of the high and low spots. Also small stones or bits of building rubble can result in boards having to be lifted for obvious reasons, so sweep the area properly and if possible vacuum it with a good quality industrial vacuum cleaner to make sure that all debris is lifted off your surface. The laminate boards will come in equal lengths but when laying them you don’t want a join line all in the same place so you will need to cut shorter lengths to create a staggered joint. Keep the off cut because it will be used on the other end of the room. Be careful too to get the ends the right way around. On each end of the board there will be grooves to clip into each other, so you want to make sure that you use the right side on each end of a length with your cut end up against the wall. On the next row of boards don’t cut the short one to the same length as the previous row, make it a little longer or a little shorter, so as to never create a straight line of joints. The joints should always be completely randomly staggered. Gaps of about 6 to 10mm should be left on the sides and edges to allow the wood to expand and contract. This can be covered later with a skirting. If no gap is left, the wood will try and expand, push up against the wall, and the boards will pop. For a free no obligation quote on laminate or hardwood flooring please complete the form below. 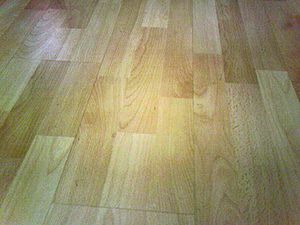 This entry was posted in Cape Town, Durban, Laminate Flooring and tagged flooring, flooring installation, laminate floor boards Cape Town, laminate floor boards Durban, Laminate Flooring, laminates by Erin. Bookmark the permalink.